We’re excited to kick off today a series of political cartoons from historian and illustrator Mark Wahlgren Summers, author of The Ordeal of the Reunion: A New History of Reconstruction. On Thursdays over the coming weeks, we will feature a new cartoon—hand drawn by Summers—that offers a creative, satirical spin on Reconstruction history. Each cartoon is accompanied by brief commentary from the author/illustrator to help put things into context. These cartoons stimulate your brain, tickle your funny bone, and bring history to life in a whole new way. 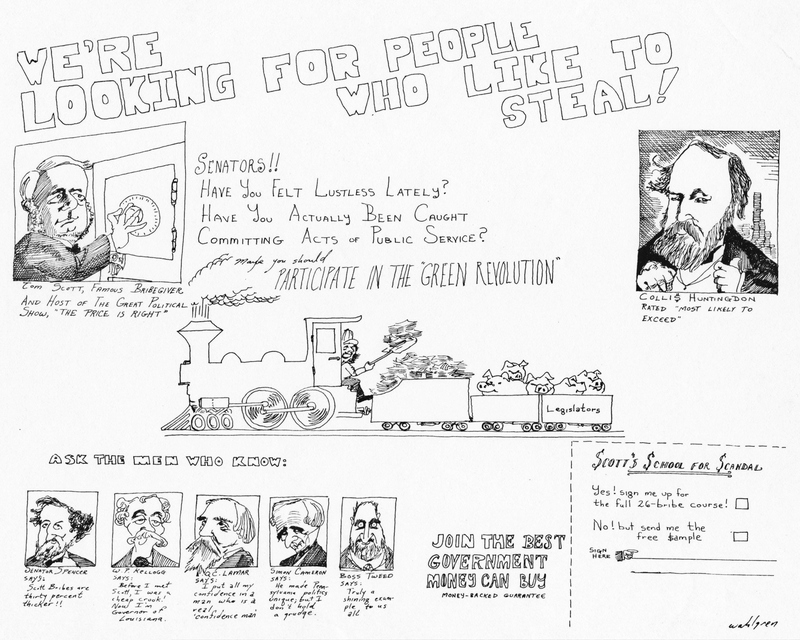 “We’re looking for people who like to steal.” The postwar era has gone down among historians as “the Great Barbecue,” “the Blackout of Honest Government,” and “The Era of Good Stealings.” It was unquestionably corrupt, and among the greatest corrupters were the railroad executives, out for subsidies and advantages. Tom Scott’s Pennsylvania Railroad dominated the Keystone State as completely as the Camden & Amboy did New Jersey’s. Senators took retainers from the corporations they defended, and a railroad construction firm, Credit Mobilier, passed out stock at bargain rates to congressmen who otherwise might wonder how government funds used to build America’s first transcontinental railroad actually had been spent. Mark Wahlgren Summers is professor of history at the University of Kentucky. He is author of The Ordeal of the Reunion: A New History of Reconstruction, A Dangerous Stir: Fear, Paranoia, and the Making of Reconstruction, and many other books.